Desiring to slim your face and have a V shaped face? Summerskye MD’s non­surgical jaw reduction procedure will help you accomplish that. We provide various facial treatments, such as Jaw Slimming, which has become very popular for both men and women. We use Botulinum toxin (Botox) injections to reduce jaw size and excessive teeth grinding (Bruxism). This treatment will be carried out by our highly experienced, Botox specialist. Although a strong, square jawline is considered masculine and desirable in males, many females prefer a more rounded, thinner oval or heart­shaped face, which creates a softer, more feminized and attractive facial appearance. Females with square­shaped face seem to look masculine, which is not the ideal look men are looking for in their partners. Women with slimmer jaw seem a lot more ladylike. Having a V- shaped face in women makes them look slimmer and younger. By reducing the width of the jawline, the Botox jaw reduction technique transforms an overly square and masculine face into a more graceful, pretty and ideally feminine oval or heart­shaped face. In some patients, an enlarged masseter muscle (a cheek muscle used for chewing) creates extra facial width that can be selectively and gradually reduced over time with Botox, as this relaxes/weakens the muscle and thereby, causes “shrinkage” over time. Often stress­related, night­time teeth grinding (bruxism) may enlarge your masseter muscle. Botox may reduce bruxism, as well. How Safe is Jaw Slimming? It is a myth that to achieve a V­shaped face, invasive surgery (such as cutting the jaw bone) is necessary. The reality is that there is a safe and effective non­surgical, non­invasive method to achieve square jaw reduction. 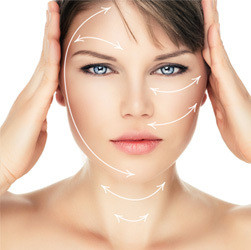 Botox, which has revolutionized facial reshaping, is used for these treatments. Jaw reduction surgery, which was the procedure used in earlier days, required a long and often painful recovery and results which were inconsistent and/or unnatural. This surgical procedure had side effects which was alarming to many. Botox is extremely safe, effective, non­surgical, painless and with minimal downtime. There will be no significant swelling or bruising after the procedure. The treatment takes only five minutes as an office procedure and there are really are no restrictions in your activity post procedure. There is no need to miss work after a day’s treatment. Our patients who have received this treatment were able to see softening of their cheek muscles within 1 to 2 weeks and noticeable jawline softening and improvement within 4 to 6 weeks. Some of our patients will require a touch­up or second treatment at the 2 to 4 month mark. Most patients require periodic, maintenance treatments at 4 to 6 month intervals.